As a Personal Trainer with an additional credential as a Certified Sports Nutritionist, I am frequently asked by clients how much they should eat, and what to eat. I generally hesitate to create meal plans for them, since I don’t feel that I am doing my best by doing so. I would rather teach how to eat properly, and therefore give clients the skills they need to achieve their goals and maintain them over their lifetime. Plus, they will have much more variety, preventing the feeling of boredom or burnout with a diet regimen. However, if making a meal plan is a shorter way to this end (and I believe it can be in some situations), I am happy to help– so I will post more and more meal plans in a folder on this blog site. In order to help me when I am trying to teach people how to eat properly, I like to ask them to analyze what they eat. That way, they choose the foods and eat according to their likes and dislikes. They stay in control. So, I ask them to enter their foods into an online nutritional analysis source, and I review it with them and make any changes we can. I recently reviewed a few of my favorite sites in order to pick one I thought was the best. I have a favorite, by far. A little-known site (at least, I have never met someone who had heard of it before I mentioned it) that is the top pick, in my opinion, is Cron-O-Meter. Hands down. I compared other sites, such as MyFitnessPal, SparkPeople, Self Magazine’s version, ChooseMyPlate, etc. Cron-O-Meter has the most nutrients included, so it gives you the most information. I admit it, entering foods into a program like this can be tedious and time consuming (thus the desire, I think, for me to create meal plans), but I think it is well worth it in the end. And, since you are putting in the time to do it, you might as well get all of the information– why do it and not realize that you are lacking in B vitamins, for example, and then wonder why you exercise and eat healthy but still feel run down and out of energy? The time it takes to enter your foods on Cron-O-Meter isn’t overbearing, either– it is very user-friendly. It has lots of brand name foods already in there, not to mention restaurants, and it is easy to navigate. The best part about Cron-O-Meter: It’s Free!! There are different levels of subscription to Cron-O-Meter, but the free version is great, and I see no need to upgrade. If you try it and have a daily intake where most nutrients are near intake levels of 100%, please share! Hope this helps you *enjoy* a healthy lifestyle! Trans fats have been around for over 100 years. Crisco was first made in 1911, and was almost entirely made of hydrogenated oils (=trans fats). Their use expanded pretty continuously, and they appeared in all kinds of foods– I remember going through the grocery store one night, and finding them in Raisin Bran Crunch and Fiber One cereals, Healthy Choice microwave dinners, as well as in the foods you would expect to find them, such as desserts and processed foods. Research started showing negative effects of trans fats on cardiac health– specifically linking them to heart attacks– in the 1990s. It wasn’t until 2006 that the FDA created requirements that food products had to state on the label if they had trans fats in them. As more and more evidence has shown the severity of the threat to people’s health from trans fats, the FDA removed the “Generally Recognized as Safe” classification from trans fats in 2013. So, two years ago, the FDA recognized that trans fats are not safe, but yet it was only yesterday the news broke that the FDA said they are starting the process of banning them from our food supply. According to FDA, food manufacturers will have three years to take them out of their products. So, trans fats will be around until at least 2018. There is actually more bad news that is not, well, in the news. While the word has been spreading the past few years that trans fats are bad, some food manufacturers have given in to public pressure, and started changing their foods. They started taking out the trans fats in their products, and replacing them with mono- and diglycerides. You may have seen these listed in the ingredients for many foods you buy at the store. And guess what: they have been around since the 1970s, there has been almost no current research on their food safety, and they are “Generally Recognized as Safe” by the FDA— at least, at expected levels of consumption…. in the 1970s. Of course, consumption will skyrocket as their use skyrockets to replace trans fats. And guess what may be contained in mono- and diglycerides…. Trans fats! So, this move by the FDA to ban trans fats is something, but if it in any way makes people in the US feel more secure that they are being protected from harmful substances– I hate to sound like a conspiracy theorist or anti-government doomsdayer– but please understand how incredibly unprepared the FDA is to fight food companies. Now maybe people will stop examining boxes they buy at the grocery store (if they even checked in the first place), figuring the FDA is making food companies make their products more healthy, so they think they can stop worrying. The truth is that nothing is really going to change that much. Mono and diglycerides are something to avoid, too! Just another example that if you can’t pronounce it, you likely shouldn’t be eating it. Please, please, read labels of foods you buy at the store. Opt for healthy, whole foods like fruits, vegetables, nuts, whole grains, and healthy protein sources. Remember: healthy, clean eating can be delicious, too! I have created a recipe for a chocolate snack that I have made for a few people, and have gotten positive feedback. It took a bunch of tries — adapting it constantly to try to get the consistency, taste, and healthy value to be in balance (not too easy!). I am happy with this creation. I hope you will try it, and love it! It has only healthy ingredients, and has healthy fats, fiber, vitamins, minerals, phytonutrients, and is a complete protein– perfect for vegetarians! Please watch my video on YouTube, and if you subscribe to my channel (which is free), I will send you the recipe (or just send me an email to get it for free). This recipe is great for a snack for adults or kids, can cure a chocolate craving– with no guilt!– or be easily carried for lunch to work or school for the kids, or just eaten with a spoon, or mixed with peanut butter, or as a frosting. Thanks so very much for watching, and I hope you will watch my other videos, too! New ways to get in shape! I have started a YouTube channel! It is completely free. I have (so far) posted two workout videos for anyone to do at home. One is a basic workout–a beginner’s level–emphasizing strengthening around the hips. The other is a harder workout, targeting the underarm area, and is meant for those who are looking for a challenge. Please go ahead and try them out, and let me know what you think! I am hoping to keep making more and more videos, so you could pick your level, and what area you want to target that day. Could you help me out? In order to make this worth spending all the time filming (and re-filming when I mess up, and re-filming…! ), I have asked YouTube to put ads on my videos. The more people watch them, or click on them, the more money that would come to me. It is kind of a long shot– I think it works out to 10,000 views gets you about $1— but if I could get a couple of bucks, it would help me be able to reserve time to keep making more videos. I would really appreciate if you would have patience with the ads! Thanks so very much for your support! Also, I have been inspired to teach a class just for women about the basics of football. I feel bad watching friends get teased by their boyfriends or brothers when they ask a question about what is going on during the game. So, with Super Bowl Sunday coming up, I thought I would teach the basics to women, in a supportive and friendly environment. If you want to have more to talk about with male (or female!) co-workers, or want to better enjoy time with a significant other or friends who are football fans, please sign up for this class! I am offering it at three different times, at three different locations. Since I have spent 3 of my high school years and my college years on the sidelines of my schools’ football games as a student athletic trainer, and grew up going to football games with my die-hard football fan dad, and teach the history of sports at Scottsdale Community College, I have learned the game over the years. I would love to help improve your life! This is meant to be a basics class, ideal for those who don’t know what “4th down and 2” means. Cost: $15 to cover the cost of room reservation and printing. Seated is Limited! Must register at least three days in advance. Feel free to share this email with a friend. Thanks! Email or call me with any questions, tips for upcoming videos, other classes you would like to see me offer, etc! Have a wonderful 2015, every day, the whole year through! Here are some tricks to avoid the bad treats! Halloween is generally the start of the holiday season. Many Americans exercise less and eat more during this time, and therefore end up gaining body fat. Avoid it this year! In fact, I hope you can get into better shape this holiday season, and that your family enjoys doing it with you! 1. Put oatmeal into a food processor, and process until a fine powder. Put into a mixing bowl, and add all dry ingredients. Mix. 2. Add all wet ingredients, and stir until smooth and blended. 3. Spray/coat muffin tins or a small baking dish with olive oil, and place batter evenly in pan or tins. 5. Add frosting when cool. 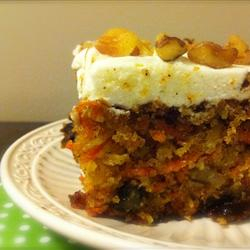 Sprinkle with remaining walnut and pineapple pieces when serving. Mix all ingredients together with a mixer. Doing some weight training helps tone lean body mass. Lean body mass is metabolically active, so it helps keep our metabolism higher when we tone and challenge it. 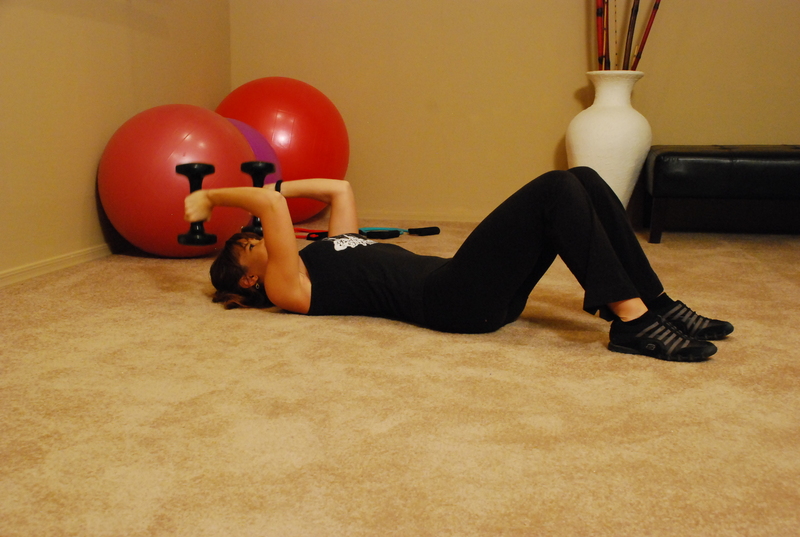 Skullcrushers are a great exercise to help tone those upper arms. 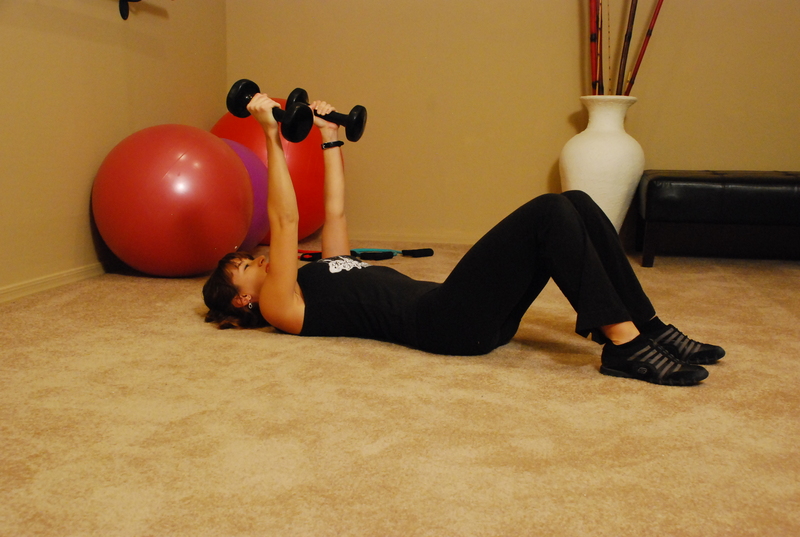 Start lying on the floor with a pair of free weights, or anything heavy that you can hold easily. Extend your arms straight up in the air–like the first picture above. Keep your elbows still, directly over your shoulders. Bend arms at elbows (elbows don’t move!) and bring the weights down toward your head, carefully! You should look like the second picture above. Extend arms back up, until arms are straight. Repeat until the back of your arms are burning (not painful! ), hopefully around 12 or 15 or 20 reps. Take a break for about a minute, and then repeat. Can do three or more sets if desired. Remember that great company makes the holidays happy, not the food and drinks. 🙂 I wish you a very Happy Halloween! Way to go, Always brand, for a fantastic ad. The morning news shows are all talking today about a new report about how skin has been shown to stay healthier due to exercise. The great results from a study just published (link here to the NY Times report) showed that people who exercised had skin of 20 or 30 year olds, even if they were over 40, or even over 65! But, this isn’t even the whole story! I just talked about this in one of my classes, actually! I teach Exercise Science classes at two local community colleges. Another reason they didn’t touch on in this article is that cortisol, the “stress hormone”, causes our bodies to stop the re-building of collagen (collagen is constantly being broken down and rebuilt by our bodies). When we are stressed, we create cortisol, and the breakdown of collagen still happens, but the rebuilding is slowed or stopped entirely. Exercise is the best way to “burn off” cortisol; but, if we don’t exercise, we have to wait a bunch longer for the stress to go away and therefore our levels of cortisol to decrease. Of course, if we are constantly stressed, like many Americans, and don’t fit in exercise, then we don’t ever get our cortisol levels down. So, collagen keeps getting broken down. Collagen is a connective tissue, and makes a firm matrix in many tissues, like our skin, and in our cartilage, like the cartilage in our knees, for example. Without healthy collagen in our skin, our skin sags. Plus, the cartilage in our knees, and other areas of our bodies, is weaker, which can lead to an increased risk of damage to our cartilage– leading to meniscus tears, or increased risk of arthritis. I did the first ever Women’s Half-Marathon in Scottsdale/Tempe this past Sunday. I can’t really say I officially trained for it, but I have been trying to walk/run with my dogs trying to get me in some sort of better shape. I am not a big runner–it feels awkward to me, and I prefer to ride my bike or use my elliptical so much more, so I usually pass on running. Still… I haven’t done much more than a half an hour at a time on the elliptical, and I haven’t ridden my bike in quite a while. So you understand that I’m a personal trainer. I do try to be faithful to practicing what I preach so that I can look my clients in the eye when I say that they can fit in exercise, that I do too and I’m busy. I think people’s expectations of me are that I am in pretty good shape, and I think they are very justified in having that expectation. From the 50-54 range, 167 participants out of 259 beat me (more than half!). The winner of this age group beat me by 1 hour and 14 minutes. From the 55-59 age group, 69 out of 115 beat me (more than half!). The winner, at age 58, beat me by 1 hour and 15 minutes. From the 60-64 group, 21 out of 53 participants beat me (almost half!). The winner, at age 64, beat me by 1 hour and 11 minutes. From the 65-69 age group, 9 out of the 17 participants beat me (more than half!). The winner, at age 65, beat me by 51 minutes. So, I hope you find this encouraging. If you are reaching the “mature” age groups, there may be no reason why you couldn’t try to do a half-marathon. There are others out there doing it! And, they are beating me! Maybe you will, too!